Guys, after years of saying "I can't quilt", I finally jumped in and MADE A QUILT. Now, it's not perfect. It's pretty puckery and the free-motion stitching looks... interesting at best, but boy am I ever proud of myself. Today I'm going to share a tutorial showing how you can make your own quilt just like this one. But first, a little back story. After seeing this inspiration image from the incredible Nancy Scott from Masterpiece Quilting a few years ago, I decided to try and make up my own pattern to recreate it for myself. 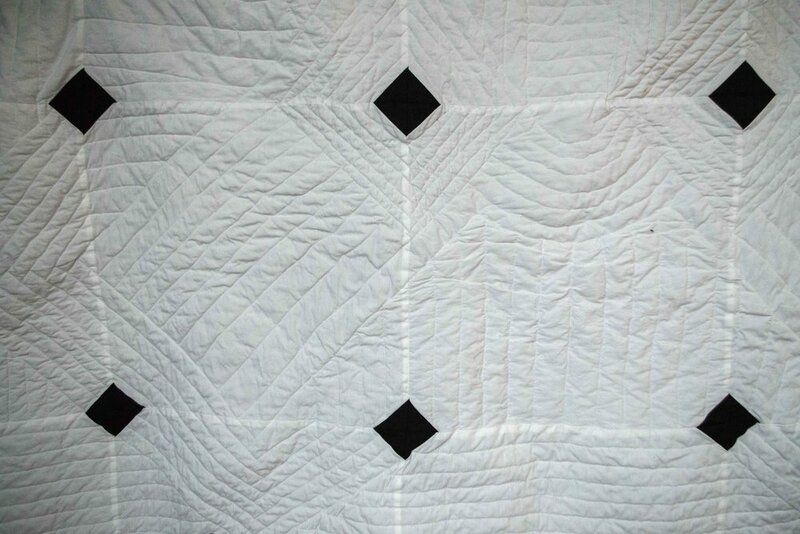 What I liked about this quilt was that the piecing looked simple, and great quilting really made it shine. I figured that since the piecing wasn't as complex as other patterns, it might not be too difficult to sew up for my first big project. Before we jump into the tutorial, a few thank yous are in order! While making the pattern, I was lucky enough to have the help of the super knowledgeable Holly-Anne from String and Story to help me learn how to make this quilt. I really can't take credit for figuring any of this out, it was all her and her quilting genius! She also shared a whole lot of tips with me for sewing the quilt, which helped me make this piece a reality. If you're looking for an awesome quilting resource to help get you started, she's one of the best. In addition, I was able to get in contact with the lovely quilter who made my inspiration piece, Nancy Scott. She sent me a bunch of information about the quilt that was incredibly helpful for making my own version. The book that inspired her version is called Quilting with Style: Principles for Great Pattern Design by Gwen Marston and Joe Cunningham. Two king sized flat sheets, one white and one black. Three packages of extra-wide double-fold bias binding in black. My Cricut Maker with the rotary blade. This made cutting properly sized quilt squares incredibly easy! I've learnt over a few unsuccessful attempts at quilting that having accurately cut pieces is the key to having your quilt turn out as planned. My washable fabric pen from Cricut. The important part is that your marker is washable, not fast fade. That way you can trace your quilt lines without having to worry about them fading over time - your fabric will stay marked until you wash it! Once you've got your supplies, it's time to get cutting! To keep things simple while developing the pattern I decided to make this quilt a perfect square. I also drafted the pattern pieces in centimeters, because, let's face it, fractions are confusing (especially when you grew up with the metric system!) You can always convert these pieces to inches, but I promise you once you get in the habit of sewing with centimeters it's really a lot easier. I kept a lot of the pieces large to make it more beginner friendly - the less piecing the better, in my humble opinion! This means that I couldn't cut everything out with my Cricut Maker - but it also meant I had less pieces to sew. These formed the inside of the quilt. These went on the corners. Small Squares - 7 x 7 cm - 64 pieces from black sheet. I simply made a 7 x 7 cm square in the Cricut Design Space, duplicated it 64 times, then cut it out on my fabric mat. This fits onto two 12 x 24" mats and cut quickly while I did the bigger pieces by hand. I couldn't imagine cutting out all of those little squares by hand - and look at how accurate they came out while using my Cricut! The black sheet will also become the backing for your quilt. To make sure you have enough fabric leftover for the back, make sure you trim off the fabric for the squares from the taller sides of the sheet. These pieces were designed to be sewn with a 1 cm seam allowance. 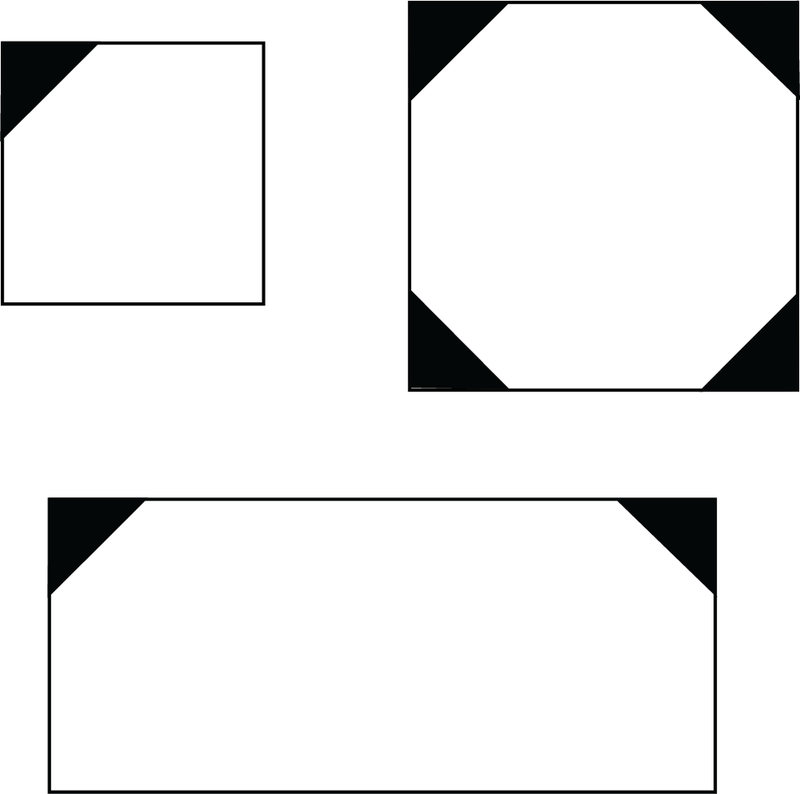 Each large square needs a black square sewn on every corner. Each large rectangle needs a black square sewn on two of it's corners, along one of the long sides. Each medium square needs a black square sewn on just one corner. 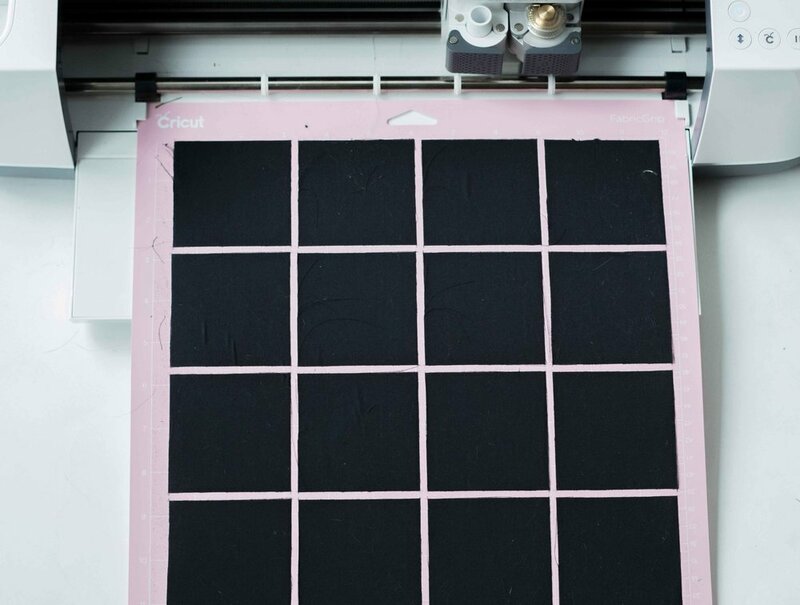 To sew the squares onto your pieces, pin a black square onto the corner of your piece. Sew from one diagonal corner of the square to the other, fold the square back along this seam, and press into place. Once you have all of the squares sewn on, it's time to piece your rows together. I made a mock up of my quilt in illustrator - here's what the diagram looks like. I started sewing the horizontal rows first, then sewed the rows together. You'll want to pay careful attention to matching up the black squares together so the diamonds come out neatly - the more accurate these are cut out, the easier this will be! My inspiration image used a lot of intricate free-motion quilting to add interest to a relatively simple quilt design. Free-motion quilting is a tough skill for a beginner quilter to learn, so I tried to use a lot of random geometric lines in my quilt to give a similar effect that was a little easier to recreate for my skill level. 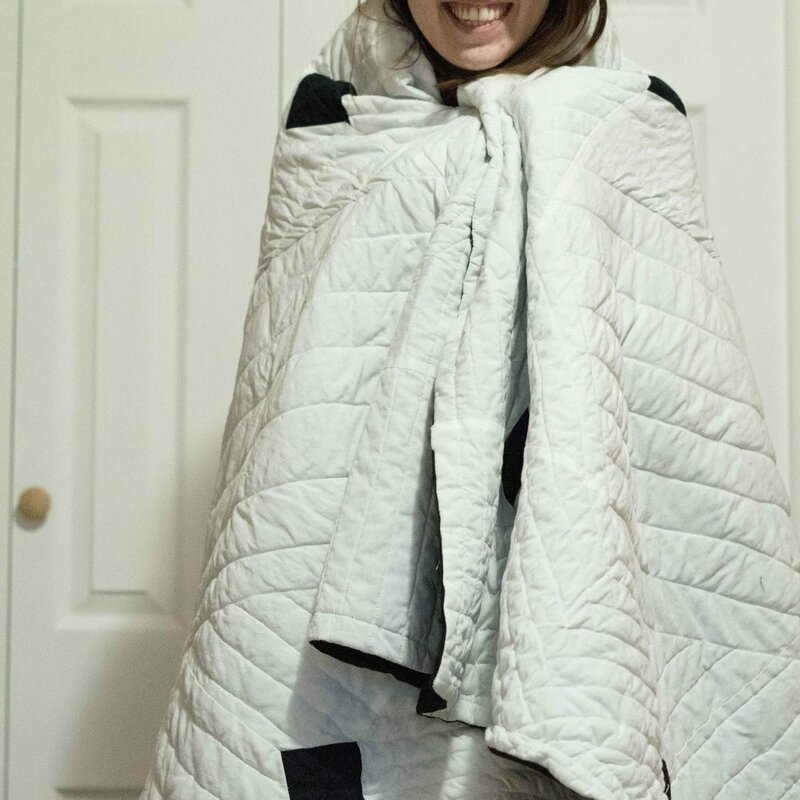 I don't have a specific diagram showing exactly how I designed my quilt lines, because I thought the best part of the project was coming up with my own crazy design, but I do have a couple of images to show you for inspiration! Now, if you wanted to keep things simple for you first quilt, you could just quilt this using evenly spaced straight lines - it doesn't need to be wild and random unless you want it to be. One mistake that I made was drawing my quilt lines onto my quilt before I had basted it together with spray baste. I followed this tutorial here to make my own homemade spray baste, and since it's made with water, it actually started to rinse some of my carefully-drawn quilt lines away! In future, I'll definitely baste before I draw my lines to prevent losing them again. Learn from my mistakes, friends! When it comes time to draw the lines on your quilt, I suggest that you baste your black backing, batting, and pretty quilt top together before drawing the guide lines on. Once you've got your lines drawn, it's time to start quilting! Once I had the quilt basted together, I started quilting along the lines I had drawn previously, starting in the center and working my way outwards - standard quilting procedure. Since all my lines were drawn in the last step, all I had to do was follow my own guides. I used a walking foot for most of the lines in this quilt as recommended by everyone on Instagram, except for on a few curved lines near the center of the quilt when I tried free motion stitching without a darning foot, from this tutorial here. This was really challenging to do, and I have no idea if this will survive long term, but it was a fun experiment to try on this project! Once you have quilted all of your lines, it's time to finish the edges with a little bias tape - after that, you're done! You made a quilt! Have you given Quilting a try? Without a doubt, this quilt was a huge labour of love, but it feels really rewarding to make something so beautiful that gets to be used every single day! Plus, seeing how much my cats love this quilt has me thinking I should make another for our sofa next... so I think this means after years of saying I'm not a quilter, I might just have converted a little (although it will never replace my first love, apparel sewing). Have you given quilting a try? I've got to admit, this attempt went a whole lot smoother than the quilts I've tried to make years ago because my blocks were cut very accurately (thanks Cricut!). I would love to hear if you have any favourite quilt designs to inspiring my throw quilt down below!